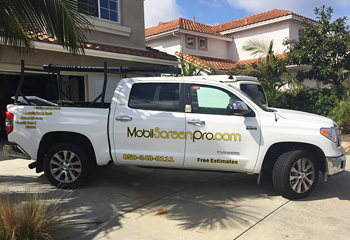 Mobil ScreenPro – Mobil Screen Pro is an on site mobile window, swing & sliding screen door company. We fabricate at your location. Guarda/Meshtec Premium Security Doors and Windows are world-class quality products that help protect your family while also providing unobtrusive views of the outdoors. Guarda/Meshtec products are available in a wide range of configurations and colors to suit your personal requirements. Guarda/Meshtec is architecturally designed to easily incorporate into general doors and windows, whether aluminum, UPVC or wood framed, for both new and existing properties. Thank you for visting Mobil Screen Pro. We are the leader in San Diego screen door installation and refurbishing. © 2019 Mobil Screen Pro. All Rights reserved.